Wow, one of those glorious spring days on the East Coast! Seventy-five degrees, bright blue sky, low humidity with a slight breeze. We certainly deserve this after a brutal winter. I have all the windows open and can hear the birds singing. “Les Miserables” is playing in the background. I’m such a sucker for this musical–read the book in high school and nearly died, then saw the stage production. I was positively stunned by the music and how perfectly the lyricist captured the sweet agony of the story. That doesn’t happen often, hmmmm? Took a couple photos of the mahonia next to our driveway. It’s such a nice, four-season plant. 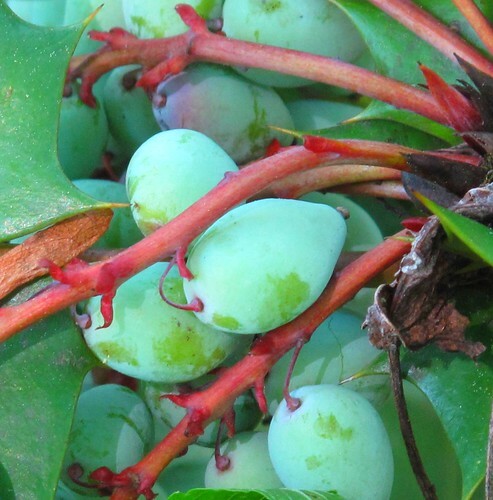 I like that it blooms when nothing else does, then produces these cool berries that photograph so well. Supposedly, they’re edible and high in vitamin C.
I think the stems here look like little arms trying to hold onto the berries…. I might have to play with this one–it looks a bit painterly. Stay tuned…. 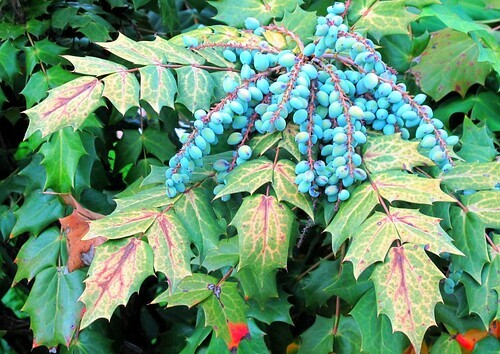 This entry was posted in gardening, photography and tagged berries, mahonia. Bookmark the permalink.